OLA’s NJHS has partnered with Community Recycling and their ShoeBox Recycling program. Together we are on a mission to help promote the importance of shoe recycling. ShoeBox Recycling is easy, engaging and rewarding for everyone involved. Participating is simple. We are collecting gently used shoes for reuse, meaning all the shoes we recycle as a group are destined for another home. From South America and Africa to areas right here in the United States, our ShoeBox Recycling efforts will go to help people and communities in over 50 countries. 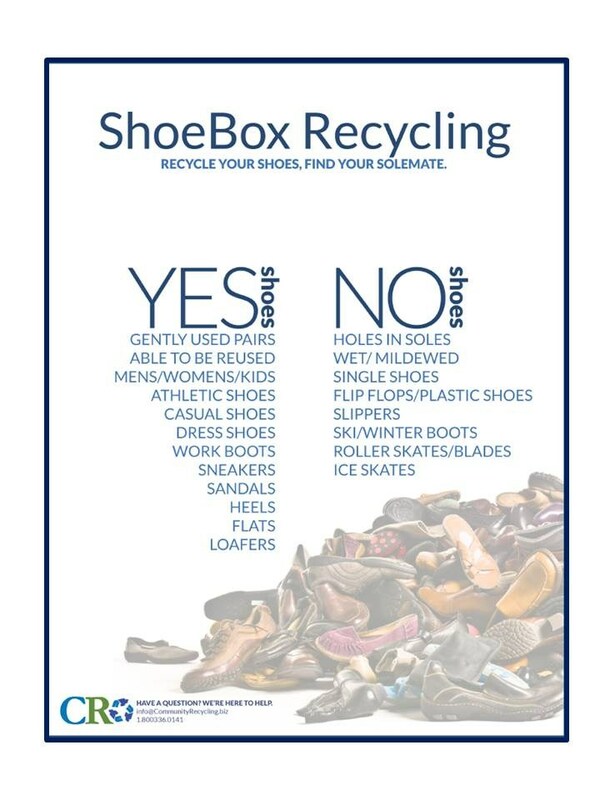 Also, Shoe Recycling will also help keep usable shoes out of our local landfills. So start cleaning out your closets and start looking under your bed for gently used shoes. Every pair you recycle means less landfill waste! Please drop donated shoes in bags off at the library. The OLA Lynnfield chapter of Our Lady of the Assumption School is a duly chartered and affiliated chapter of the National Junior Honor Society. Membership is open to those students who meet the required standards of evaluation: scholarship, leadership, service, citizenship, and character. Standards for selection are established by the national office of NJHS and have been modified for our local chapter. Students are selected to be members by a five-member Faculty Council, appointed by the principal, which bestows this honor upon qualified students on behalf of the faculty of our school each year. Students in the 7th and 8th grade may be eligible for membership in our local chapter. A student must have a minimum grade point average of 95 on a 100 % scale. Upon invitation, the student must complete a Candidate form that provides the Faculty Council with information regarding the candidate’s leadership and service. In addition to involvement in leadership activities, participation in student activity organizations and 5 hours of community service is also required. The Faculty Council reviews the Candidates’ forms and the students’ school disciplinary records. The Faculty Council may also ask members of the faculty for input regarding their professional thoughts on a candidate’s service activities, character, citizenship, and leadership. This information is carefully reviewed by the Faculty Council to determine membership. A majority vote of the Council is necessary for selection.